Hot Stone Therapy is one of the fastest growing therapies in Europe. Its roots go back to Native American Indians and was traditionally used on abdomens to aid digestion, on muscles to relieve strains and tension and on joints to increase mobility. Today, the hot stones are strategically placed on the body and are applied in massage using aromatherapy oils to help release the stresses and strains of everyday life, as well as specific problems such as migraines, sinus trouble and muscular/joint stiffness. Whilst the overall benefit is one of relaxation, the increased energy felt, will stay with you for several days afterwards. 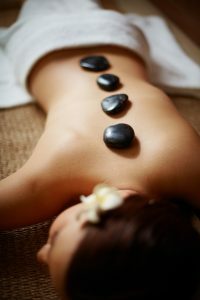 A truly heavenly experience combining massage, hot stones and aromatherapy. This wonderfully relaxing treatment works on the shoulders, neck, scalp and face and is guaranteed to leave you feeling completely de- stressed yet energised at the same time. This is reflexology with a difference! Using the calming warming powers of Hot Stone Therapy, this treatment will not only help you to relax but will leave every muscle and joint in your body feeling as though it has had a massage. A traditional type of deep massage to increase circulation and improve muscle tone. The addition of Aromatherapy Oils can be used in order to enhance the benefits of this treatment. With special attention paid to the neck and shoulders, this is not for wimps!!! Using deep manipulative pressure on extremely stressed and tense muscles this massage is designed to ease out any knots and muscular strains. Please note you may be advised to have several of these treatments in order to receive the full benefits. Eases away daily stresses and tension, and uses a suitable blend of aromatherapy oils.